The Collinsville, Illinois tower dates back to 1949, and when the Brooks company relocated to Indiana in 1959, the bottle remained. 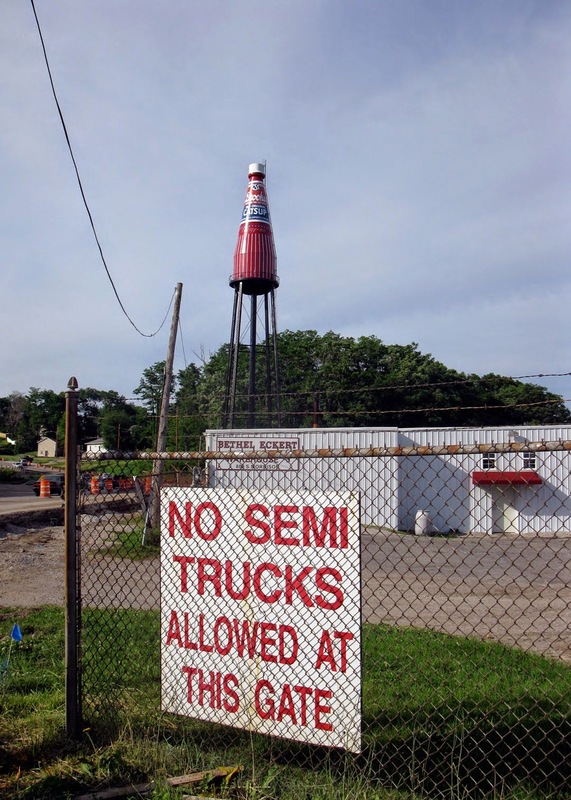 In 1993, the bottle's owners wanted to sell the property and the Catsup Bottle Preservation Group was formed to keep it standing. 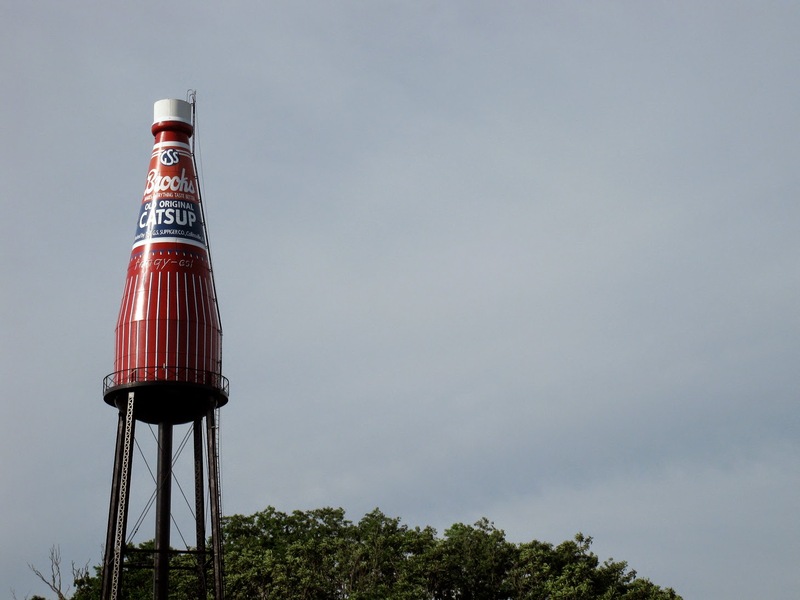 If you have $500,000 lying around and you're in the market for a 70-foot tall, 100,000-gallon water tower that carries bragging rights as the world's largest catsup bottle, have we got a deal for you. Bethel-Eckert Enterprises, the owners of the bottle, decorated in 1949 to resemble Brooks Old Original Rich and Tangy Catsup which used to be bottled at the plant next door in Collinsville, Illinois, just outside St. Louis, put the bottle and the property on which it sits up for sale last June and so far offers, much like ketchup pouring from a bottle, have been rather slow. 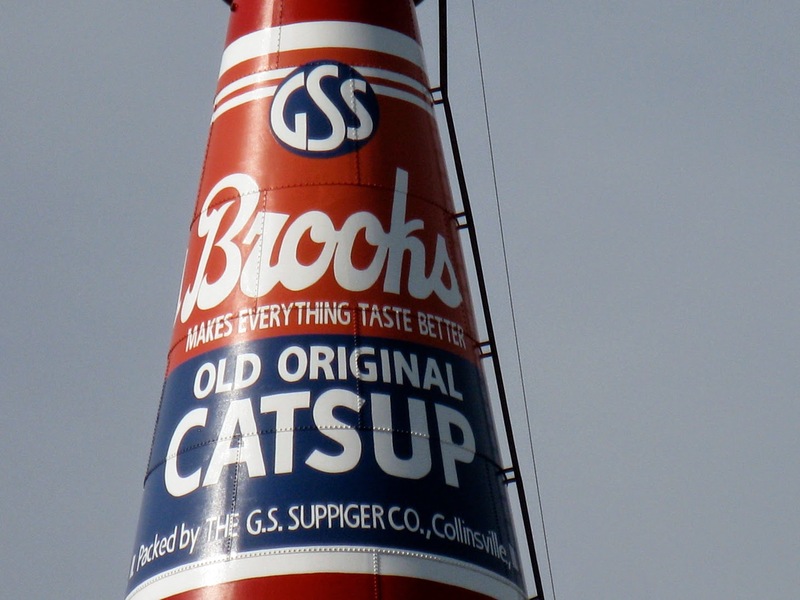 It came as a surprise to us, and many other of the bottle's fans, that it was privately owned, as it has been on the National Register of Historic Places for some time and has been the source of a Catsup Bottle Preservation Group and yearly catsup festivals in Collinsville. A Mr. Mike "Big Tomato" Gassman, leader of the Preservation Group, is optimistic a sympathetic buyer will be found soon. We hope so, too, because if the future of the bottle is in a pickle, we hope a buyer will mustard the strength to overcome doubt and relish it, if you catsup our drift.